It seems crazy to have to tailor office policy because of the advent of a new phone app, doesn't it? But this is exactly what is transpiring due to the overwhelming popularity of Pokémon Go, an app for your phone that allows you to "catch" monsters in your own environment, with the use of your phone's camera. A new Forbes magazine poll indicates that as many as 69 percent of Pokémon Go users play at work. Compare this to the TechCrunch poll stating that only 61 percent of Facebook users log on while at work, and you begin to see the staggering impact of this new game on an office atmosphere. At first glance, the game seems relatively harmless. Catch Pokémon monsters, acquire points. But it's not quite that simple. 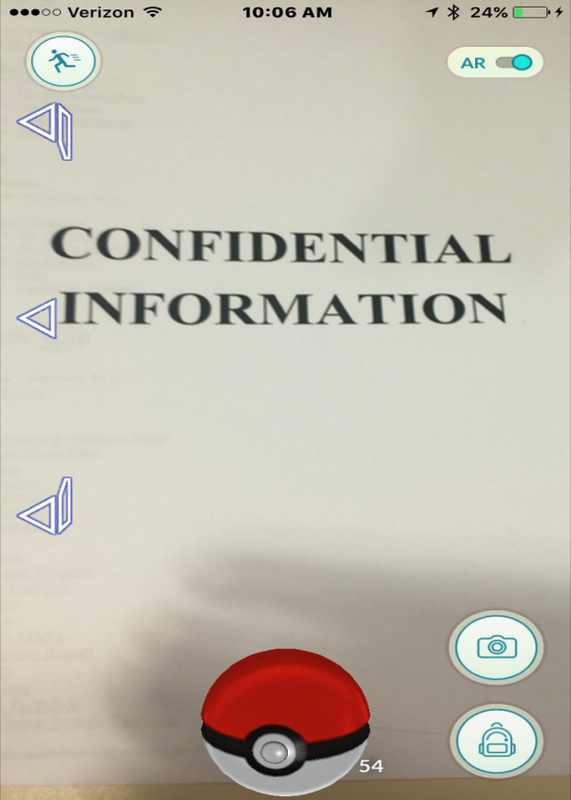 Augmented Reality Can Compromise Information. The augmented-reality feature of Pokémon Go means that employees catch monsters in a real-time environment. Many users, when catching a particularly elusive monster, feel compelled to share their catch on social media. The result? The possibility of an employee inadvertently sharing confidential company information with their entire social-media audience. Safety. Walking is an integral part of Pokémon Go – users walk to find new monsters while looking down at their phones. A number of traffic accidents have been blamed on the desire to catch Pokémon monsters; the same can happen in your office hallways. Employees not watching where they're going can create a hazard for everyone. Data Usage. Some users may use the data plans on their phones for Pokémon Go, but one of the quirks of the game is that it uses GPS signals to coordinate location – and GPS signals are often easier to acquire when the user is on WiFi. If they're at work, that means they're on their employer's WiFi, and enough users could mean a problem for the network. Employee Inefficiency. Pokémon Go doesn't necessarily take a major time investment, but the popularity and addictive nature of the game mean that users very often spend more time than they should in the app. The Forbes poll above also indicated that of the users who logged on at work, more than a third spent an hour or more playing during work hours. Those hours can add up – and ultimately subtract from the employee's effectiveness. Is Pokémon Go entirely bad? Of course not. Many companies are embracing the positive aspects of the game, and some are even making it into a game of their own. A company in the Netherlands has instituted its own internal battles, with employees splitting into factions for good-natured showdowns with colleagues. The exercise associated with Pokémon Go's requirement of movement to "hatch" new monsters or catch existing monsters can be extremely beneficial, particularly in work environments that are otherwise primarily sedentary. And a business seeking increased foot traffic can use Pokémon "monster lures" to draw users to their location. So how does an employer go about instituting a policy based on a mobile app game whose existence will likely be transitory at best? There are several ways to establish broad policies in the workplace that will apply to Pokémon Go – and to whatever game or app comes along next year to capture the imagination of employees. A comprehensive policy on the use of mobile devices at work. A clear and concise policy defining when mobile-device usage is appropriate can substantially reduce the possibility of game-related problems in the workplace. Let it happen (occasionally). Banning the game, or all games, altogether may be too harsh, so let employees play – with some general rules and restrictions about where and when it's allowed. Some companies are hosting "monster lure" lunches to encourage employees to play on their lunch hour! Remind managers to lead by example. There have been a number of news stories in the last few weeks about employees being reprimanded or terminated for playing Pokémon Go at work – and there have been nearly as many stories about managers being terminated for the same. Employers should encourage their managers and supervisors to limit their own time on mobile devices. Games like Pokémon Go are short-lived, intense fads. The popularity of the game will decrease as its novelty wears off. In the meantime, however, it can serve as a good reminder to employers to polish up and clarify their approach to the use of mobile devices on company time; and to consider harnessing the popularity of these fads to foster camaraderie among employees.